THE TOP TWO STUDENTS IN CAMEROON. If people in Cameroon and the diaspora who understand what it means by a school having the overall best results at the GCE Ordinary level were asked to guess which school would come top in 2016, most would have said Sacred Heart College Bamenda or Our Lady of Lourdes Bamenda or PSS Mankon, Bamenda. Truly speaking, these Mezam Division schools have dominated the top position at the Ordinary Level for the past thirty years if you put together key measures such as overall pass rate, quality of grades and performances in mathematics and English language. The 2016 graduating Form Five class of Saker Baptist College, Limbe, Fako division, has broken that Mezam division monopoly in grand style. The school beat every other school at the Ordinary Level (overall pass rate + average number of A grades + performance in maths + performance in English + percentage of students who passed overall including passes in both maths and English).It scored a total of 346 points and produced the top two students in the country as well. Sacred Heart College Bamenda, Our Lady of Lourdes Secondary School, Bamenda, St Benedict’s College, Mvolye, Yaounde, Sacred Heart College, Douala and PSS Mankon, Bamenda, were 2nd, 3rd, 4th, 5th and 6th respectively. The 96 students of Saker, who all passed, netted 276 A grades, 350 B grades and 298 C grades, the best results in the school’s 54-year history. ‘A’ grades were achieved in all the subjects, especially Biology (highest number of A grades, about half the group got an A in Biology), Economics (1st in Cameroon including highest number of A grades), Chemistry, Physics (the school had the highest percentage of A grades in Physics in the country), maths (4th highest percentage of A grades) and English (best English results in the country including highest number of A grades). This group of students gave Ms Stella Tonge Matuke (their principal) the best possible send-off with their stunning results. It should be noted that it was under Ms Stella Matuke that these super outstanding results were achieved and two years ago under her, Saker produced the best Advanced Level student in Cameroon. One of the students who spoke to Fako News Centre on condition of anonymity, said, quote: ’ I owe my success to my parents who sent me to Saker Baptist College, my teachers and our principal Ms Stella Matuke. Ms Matuke always made sure that we had the best teacher(s) in every subject and she was a mother to all of us. If we had a problem, we were never scared to approach her and discuss it. We feel sad that she is leaving. Also, we thank Sakerettes for always encouraging us to do well, awarding scholarships and repairing different sections of the school. Also, Sakerettes always send us good luck messages from all corners of Cameroon, Europe, North America and other parts of the world. I am happy we have made everyone proud’. GCE Board Honour Roll. Each of the seven students below had 11 straight A grades and were classified by order of merit based on their total mark scored and marks achieved within grade boundaries. 1st Clarisse Agbor Enoetie of Saker Baptist College, Limbe. 3rd Alang Diana Chen of Presbyterian Girls Secondary School (PGSS) Limbe. 4th Tchouenkam Batoum Rose Augusta of Sacred Heart College Douala. 5th Cheunwi Daniel Nganeck of Summerset Bilingual College, Buea. 6th Tachang Liza Vetmia of Our Lady of Lourdes Secondary School, Bamenda. 7th Ndjafang Jatsa Liz Mary of Sacred Heart College, Douala. FULL RESULTS OF THE STUDENTS OF SAKER BAPTIST COLLEGE, LIMBE, FAKO DIVISION, WHO PASSED IN 11 SUBJECTS. Bio-A, Chem-A, Com-A, Econs-A, Eng-B, Fre-A, Geo-A, CTZ-A, Maths-A, Additional maths-A, Rel-A. Bio-A, Chem-A, Econs-A, Eng-A, Fre-A, Geo-A, Maths-A, Additional maths-A, Phys-A, Rel-B, CSC-A. Bio-A, Chem-B, Econs-A, Eng-B, Fre-A, Geo-A, CTZ-A, Maths-A, Phys-A, Rel-A, CSC-A. Bio-A, Chem-A, Econs-A, Eng-A, Fre-B, Geo-A, CTZ-B, Maths-A, Additional maths-B, Phys-A, Rel-A. Bio-A, Chem-A, Econs-A, Eng-A, Fre-B, Geo-A, CTZ-B, Maths-A, Additional maths-A, Phys-A, Rel-B. Bio-A, Chem-A, Econs-A, Eng-A, Fre-B, Geo-A, Maths-A, Additional maths-A, Phys-A, Rel-B, CSC-B. Bio-A, Chem-B, Econs-A, Eng-B, Fre-A, Geo-A, Maths-A, Additional maths-B, Phys-A, Rel-B, CSC-A. Bio-A, Chem-A, Econs-A, Eng-C, Fre-B, Geo-A, Maths-A, Additional maths-B, Phys-A, Rel-A, CSC-A. Bio-A, Chem-A, Econs-A, Eng-B, Fre-A, Geo-B, Maths-A, Additional maths-B, Phys-A, Rel-B, CSC-A. Bio-A, Chem-B, Econs-A, Eng-A, Fre-B, Geo-A, CTZ-A, Maths-B, Additional maths-B, Phys-A, Rel-A. Bio-A, Chem-A, Econs-A, Eng-B, Fre-A, Geo-A, Maths-A, Additional maths-B, Phys-A, Rel-B, CSC-B. Bio-A, Chem-A, Econs-A, Eng-A, Fre-C, Geo-B, CTZ-B, Maths-A, Additional maths-A, Phys-A, Rel-A. Bio-A, Chem-B, Econs-A, Eng-B, Fre-A, Geo-A, CTZ-B, Hist-B, Maths-C, Phys-B, Rel-A. Bio-A, Chem-B, Econs-A, Eng-B, Fre-C, Geo-C, Maths-A, Additional maths-B, Phys-A, Rel-B, CSC-A. Bio-A,Chem-A, Econs-A, Eng-C, Fre-B, Geo-B, Maths-A, Additional maths-B, Phys-B, Rel-A, CSC-C.
Bio-A, Chem-B, Econs-A, Eng-A, Fre-C, Geo-A, CTZ-B, Maths-B, Additional maths-B, Phys-B, Rel-B. Bio-A, Com-A, Econs-A, Eng-B, Lit-A, Fre-C, Geo-B, Hist-A, CTZ-B, Maths-C, Rel-B. Bio-A, Com-A, Econs-B, Eng-B, Lit-A, Fre-C, Geo-B, Hist-A, CTZ-B, Maths-C, Rel-B. Bio-A, Chem-B, Econs-A, Eng-B, Fre-C, Geo-B, CTZ-B, Maths-B, Additional maths-B, Phys-A, Rel-B. Bio-A, Chem-B, Econs-A, Eng-B, Fre-C, Geo-B, Human Bio-C, Maths-C, Phys-A, Rel-A, CSC-A. Bio-A, Chem-A, Econs-B, Eng-A, Fre-A, Geo-B, Maths-C, Additional maths-B, Phys-B, Rel-B, CSC-C.
Bio-B, Econs-B, Eng-B, Lit-A, Fre-A, Geo-B, Hist-B, CTZ-B, Human Bio-B, Maths-C, Rel-A. Bio-A, Chem-B, Econs-B, Eng-C, Fre-B, Geo-B, CTZ-C, Maths-A, Additional maths-A, Phys-A, Rel-B. Bio-A, Chem-A, Econs-B, Eng-C, Fre-A, Geo-B, CTZ-B, Human Bio-B, Maths-C, Phys-B, Rel-B. Bio-A, Chem-C, Econs-A, Eng-B, Fre-A, Geo-C, Maths-A, Additional maths-B, Phys-C, Rel-B, CSC-B. Bio-B, Com-A, Econs-A, Eng-C, Lit-A, Fre-B, Geo-B, Hist-A, CTZ-B, Maths-C, Rel-C.
Bio-B, Chem-B, Econs-A, Eng-C, Fre-A, Geo-A, Maths-B, Additional maths-B, Phys-B, Rel-B, CSC-C.
Bio-C, Econs-B, Eng-C, Lit-A, Fre-A, Geo-A, Hist-A, CTZ-B, Maths-C, Rel-B, CSC-C.
Bio-A, Chem-C, Econs-A, Eng-A, Fre-B, Geo-C, Maths-C, Additional maths-C, Phys-B, Rel-B, CSC-B. Bio-A, Chem-B, Econs-B, Eng-C, Fre-B, Geo-C, Maths-C, Additional maths-B, Phys-B, Rel-B, CSC-B. Bio-C, Econs-B, Eng-B, Lit-A, Fre-A, Geo-B, Hist-C, CTZ-B, Maths-C, Rel-B, CTC-C.
Bio-B, Chem-B, Econs-A, Eng-B, Fre-C, Geo-B, CTZ-B, Maths-C, Additional maths-C, Phys-C, Rel-B. Bio-A, Chem-C, Econs-A, Eng-C, Fre-C, Geo-C, Maths-C, Additional maths-B, Phys-C, Rel-B, CSC-C.
Fako division had its finest GCE Ordinary Level results ever. The division’s most prestigious school, Saker Baptist College, Limbe, became the first school outside of Mezam division in the North West Region of Cameroon to occupy the first position at the Ordinary Level if you put together the five key measures that ‘advanced’ countries use in classifying schools. Four out of the best seven students who had 11A grades at the Ordinary Level in Cameroon came from schools in Fako division; two from Saker Baptist College (they were also the top two in the country), one from Presbyterian Girls Secondary School (PGSS), Limbe and one from Summerset Bilingual College, Buea. Fako News Centre is requesting that the Governor of the South West, the SDO for Fako division, the Divisional Officers of Buea, Limbe, Tiko and Muyuka, the members of parliament representing Fako division, the Senators representing Fako division, the Delegate of Education and women’s groups in Fako division, should all go to Saker Baptist College and give all the staff (teaching and nonteaching) and the girls a handshake for the school’s super-outstanding results. They (staff and students) deserve to be rewarded. The visitors should also get the telephone number of Ms Stella Matuke (who has been transferred) and give her a ring to congratulate her for the academic heights she took the girls of Saker during her time there as principal. The hard work and dedication of staff and students have secured the school’s best ever results that catapulted it to the top of the performance table, and parents are justifiably delighted with these results. We know that Sakerettes (ex-students of Saker Baptist College) will be there as they have always done. 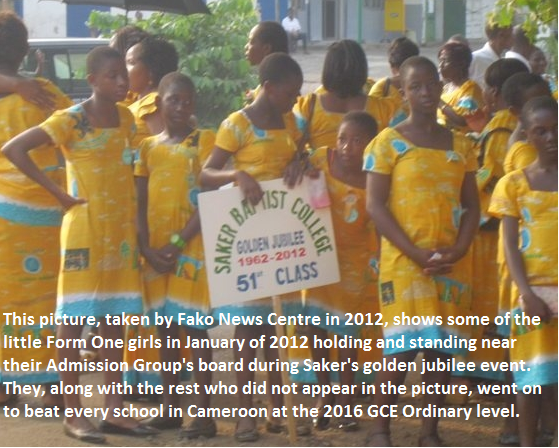 Sakerettes in Cameroon, Europe, North America and the rest of the world have made a very positive contribution towards the student-life of everybody at Saker Baptist College. Their many visits and generosity with their hard-earned cash towards their alma mater has never gone un-noticed. Many of the students Fako News Centre interviewed said that whenever Sakerettes visit the school, they(Sakerettes) always whisper in their ears to work hard and do well in GCE exams and that the words of encouragement always energise them. Fako News Centre is urging other ex-students’ groups from the South West (especially those that are full of air and have no substance) to learn from Sakerettes.